US Jews, German Jews, and German Muslims go on 'kippah walk' through Berlin against backdrop of high-profile anti-Semitic attacks. American Jews joined local Muslims and Jews for a “kippah walk” through the heart of Berlin in a show of solidarity with Jews in the German capital. 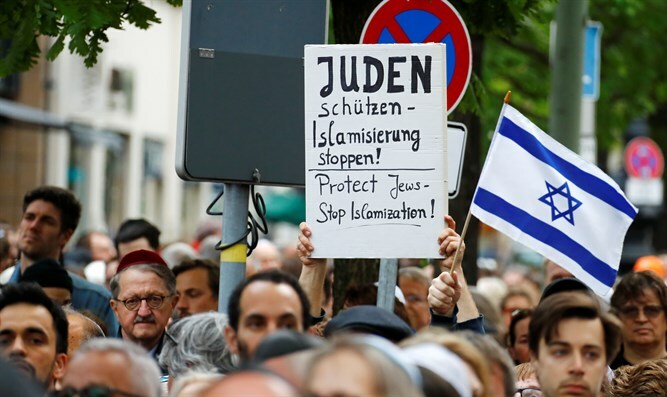 Sunday’s march came against a backdrop of recent sensational anti-Semitic incidents in Germany; most of the perpetrators were of Muslim background. Muslim students were among those who joined the stroll through the city center, an official of the Jewish Federations of North America told JTA. The walk was held during a five-day mission of JFNA, which brought some 150 participants from 34 Jewish federations in the United States to Berlin and Budapest. Along with the Muslim students, the American visitors also were joined by Jewish German students, according to Brian Abrahams, a senior vice president at JFNA. “Many mission participants never had the experience of wearing a kippah in public in America, and now here they were walking down the street in Berlin,” Abrahams said after the walk. He said passers-by noticed the sea of kippahs approaching and there were no negative reactions. In Berlin, mission participants met with local Jewish leaders who spoke about the diversity of the city’s Jewish community, which officially numbers about 10,000. Many are of Russian-speaking background. Anecdotally, there may be as many as 20,000 more Jews in the capital who are unaffiliated, including up to 10,000 Israelis. In Germany, the number of affiliated Jews is about 100,000. Estimates say an equal number are unaffiliated.